Shoehorned into a corner and eager to please, Chesterfield foursome Crackin’ Right Foot cracked off their lengthy set in fine fettle with guns a-blazing. 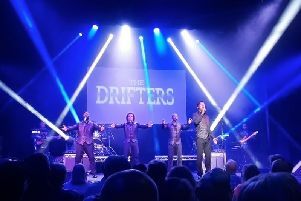 They opened their show at Sheffield’s Church House with The Strokes hit Last Night followed very quickly with The Beatles classic Day Tripper. Over the course of the evening we flirted across the musical spectrum as hits by Jimi Hendrix, The Stones, and The Kinks morphed nicely with The Rocker by Thin Lizzy and A Thing Called Love by The Darkness. Although there was poor lighting, it didn’t seem to bother the band as they ploughed on regardless. More light bulbs at the venue would have been good for both band and audience alike. Opening up part two with The White Stripes’ hit Seven Nation Army and The Rolling Stones’ tune Satisfaction kept the attentive crowd happy, with drummer Baz Rayner pounding away on the tubs with bassist Rob Williams keeping things on an even keel. Many people don’t grasp that these two elements keep a band rocking which Crackin’ Right Foot know as they’ve have been doing this a long time now. Although space was at a premium this likeable venue did show good support and respect with frontman Aaron Brown singing and sweating his little heart out and showed great confidence. To be honest, I’ve seen far less displayed from named arena filling acts. The riff master on guitar Rob Goodwin held his cool too, even when there was a malfunction with his gear and Aaron had an issue with his mic stand. The key is to carry on regardless and collectively they all skilfully filled the void with Aaron adding some nice ad-libs. With show-time over and the crowd displaying encouraging noises it was time to move on. If live music is your thing, and it must be if you’ve read this, then I firmly suggest you start at grass-roots level. These rock bands really do work and for very little financial reward. Groups like Crackin’ Right Foot firmly have their toes well and truly on the fast pedal.